Cathy Scott joins Burl Barer, Howard Lapides and Mark Boyer for an exciting hour of insights into this strange crime. Cathy Scott’s books range from The Killing of Tupac Shakur, to Hurricane Katrina pet rescues in Pawprints of Katrina: Pets Saved and Lessons Learned, and several thrilling true crime accounts, including the Ted Binion homicide case, and the murders of Susan Berman, and Biggie Smalls. 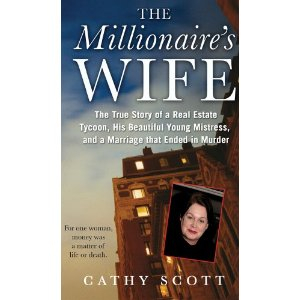 Scott’s latest best-selling true crime book, The Millionaire’s Wife, takes readers into the details of a murder for hire case that wouldn’t be solved for over 20 years. A wealthy husband gunned down on the streets of New York, a young mistress, a wife in a bitter divorce who wants millions; all the ingredients mixed into the 1990 shooting death of George Kogan. Kogan was a successful antiques and art dealer having an affair with a younger woman. His wife, Barbara, who stood to gain a $4.5 million estate, wants it all! Find out how the dots were finally connected, 20 years later in 2010, which led to justice in Kogan’s murder. You can find Cathy Scott online at her website, CathyScott.Com and all the social media networks. She is also a contributor to the Forbes Women blog, Crime, She Writes, along with Kathryn Casey, Gina Simmons, Diane Fanning, Stacy Dittrich and Susan Murphy-Milano.